School Rankings - Where does your school fit? Most home searchers look at listings for sale in terms of property characteristics, like square footage, number of bedrooms, quality of finishings and lot size. It may be difficult to rate a home in terms of neighborhood in an impartial way. This article aims to inform how schools are ranked against one another and that may provide valuable insight into the overall quality of that location versus another. This article lists secondary school rankings for the 2011/2012 year as rated by the Fraser Institute - a non-partisan, independent research and educational organization. Rankings are made for academic performance based upon standard testing that is universally administered across the province. I have summarized public secondary schools for the Durham Region Public School Board in the chart below. 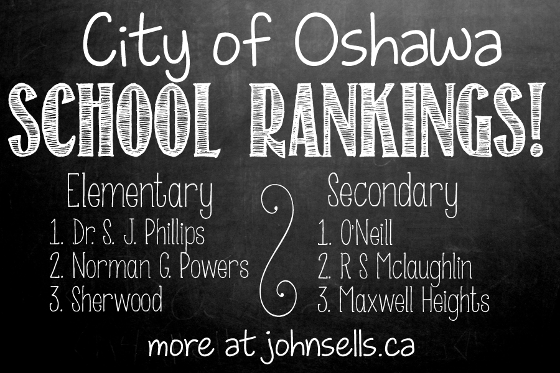 Do you know what the school rankings are for the school that your children either attend (or will attend), or for neighborhoods that you are considering a move to? Contact me to get information specific to your new home search, or for other school boards. For Durham Public Secondary Schools click here for Durham Public Elementary Schools, click here. for Durham Catholic Elementary Schools, click here. for York Public Secondary Schools, click here.